Smooth Jazz Vokal DKK 100 kr. Ben Chawes’ acclaimed debut “Up Close” propelled him through the sound barrier and into well-earned popularity, sending the singer, pianist and entertainer out on a large-scale tour of Europe, Asia, the Middle East, USA and Canada. With his timeless and sparkling personal bid on vocal jazzy pop-soul in the international league he is one of the few musicians to have sung their way to Ray Charles’ heart. And he is the only musician ever to sign an exclusive sponsorship deal with the crème de la crème of international audio design, Bang & Olufsen. The 4-time award-winning artist is coming back with a new and even more exiting release during 2018 that will be followed up by a tour around the world. A mouthful : Ben Chawes is much more than merely a singer. He combines an obvious crooner talent with his own special ingredient: mouth instruments. His ability to make every detail of a whole rhythm section come alive with his mouth is uncanny. At age 7 he invented the vocal drums sounding like a complete drum kit long before beat box was known. And Chawes took it further to emulate the exact sound of a grooving bass-line and a wailing guitar solo worthy of any guitar virtuoso’s envy. Ben Chawes has a talent that makes your run of the mill human beat box sound bleak indeed, and it is a part of each Ben Chawes appearance. ”You made my night” The above-mentioned spontaneous exclamation came from the king of soul, blues and jazz, Ray Charles, after a concert with Ben Chawes and his American band Vox One. It was a heartfelt reaction, and one you soon will recognise upon hearing Ben Chawes. Ben Chawes is a true performer, guaranteed to make your night – or your day for that matter – with a voice so warm and enticing, that even the coldest of hearts melt in his company. 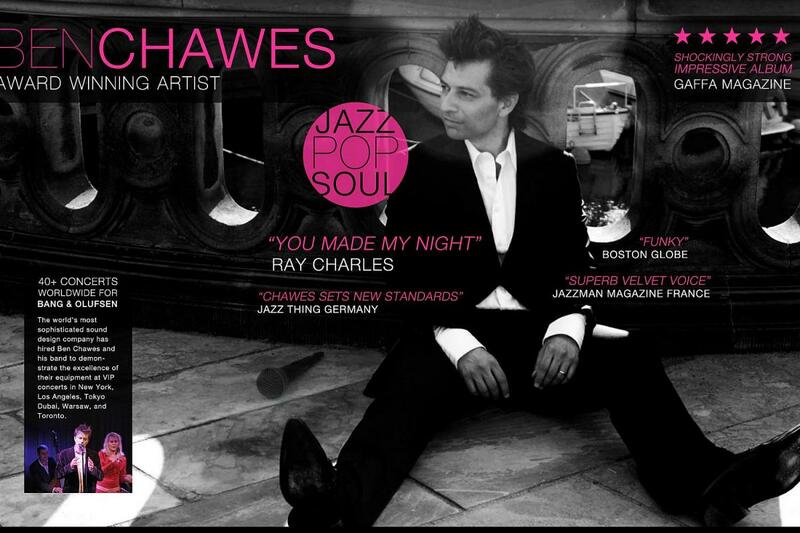 Jazz Thing (Germany) wrote “Ben Chawes sets new standards” and Jazzman Magazine (France) “Superb velvet voice”.